This is the year to be bold and have fun. Embrace the color in your life. 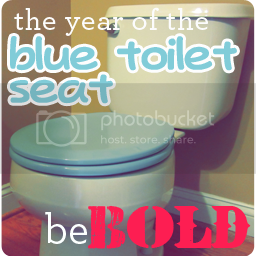 The Year of the Blue Toilet Seat was prompted by a visit to the hardware store with my daughter at the end of last year. You can read the story here. 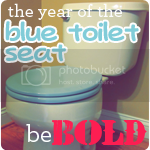 What is the Blue Toilet Seat in your life? How will you be bold this year? Please let me know in the comments. I would love to chat. You can connect with me on facebook here, or on google+ here. If you would like to join the The Blue Toilet Seat Facebook Group, let me know in the comment section, and I will add you. We encourage each other to be bold. Join the ipaintwrite community. I will send my stories directly to you. Your email address is safe with me. I promise never to sell your address or give it to my cat.